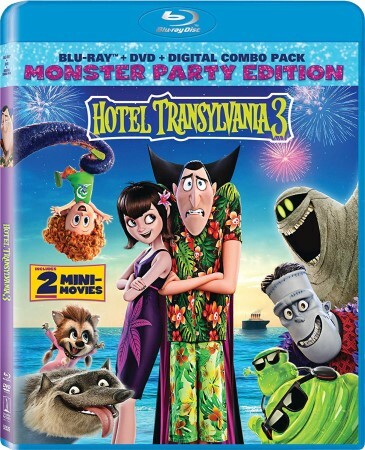 Hotel Transylvania 3 is out on home video, and we have all the details on the Blu-ray release! If you’re a fan of Genndy Tartakovsky’s previous work, then you’re going to want to check out Hotel Transylvania 3, which was, at least in this reviewer’s opinion, the best movie in the Hotel Transylvania series yet! Up until now, I have enjoyed this series, but not enough to go back to very often. I saw the other two films just once each, but I didn’t feel the need to buy them immediately after release. That changed with this one! In Hotel Transylvania 3, the characters you loved are back, but there was something about the cruise ship setting (as well as the final dub-step/EDM showdown with the big bad at the end) that made me absolutely love this movie. I know that not everyone feels this way, but for me, Hotel Transylvania 3 was a lot of fun, and a must own. But that’s just about the movie. Maybe you liked it well enough, but you’re waiting to see what kind of extras this set has before you decide to buy it or not. Well, fear not! This set is pack with extras, and has such a variety, that there is really something for everyone! From the animation fans wanting a peek behind the scenes, to the young fans who want music videos and bonus shorts! First and foremost we have a commentary with Genndy Tartakovsky himself, and he is joined by Scott Wills, the production designer, and Michael Ford the VFX supervisor. We’re getting two new original shorts on this release, Puppy! and Goodnight Mr. Foot. For fans of the movie’s music, there are also 7 sing-along videos. In addition to the sing-along videos, there is also an I See Love Dance Along video, and several lyric videos. We’re getting a couple of looks behind the scenes, including a featurette called, Behind the Screams: The Voices of Hotel Transylvania 3, and a look at some of the new faces in the franchise called Meet the New Characters. For younger fans, or those looking to catch up on the series, we have a short feature that is a look back at the previous two movies, disguised as family home movies from Johnny. Another one for younger fans, just a look at Drac’s back story, narrated as a read-along. One more for the younger set, several home activities you can do with a Hotel Transylvania theme! In addition to these, we also get trailers for the other entries in the Hotel Transylvania franchise, including a mobile game. If you haven’t seen Hotel Transylvania 3 yet, now is the perfect time to get a copy. It’s a fun family movie that you can watch over the holidays that kids and adults alike will find funny. This set has some great extras, but even on its own, I found the movie to be a lot of fun, and I highly recommend it.